I recently received a message on Facebook from a follower who was dismayed that my roommate and I — two Christians — would throw a Halloween party. She was loving in her approach and inquired with genuine curiosity rather than hostile accusation. I thought about it for a while and several reasons came to mind. I never needed to give it much thought before, since my father is a pastor and for as long as I can remember, we went trick-or-treating on Halloween. If my dad is a pastor and he takes us trick-or-treating, it can’t be THAT bad, right? So after some thought, here are a few reasons I not only think Christians can, but should celebrate Halloween. When we think of spiritual disciplines, we tend to think of fasting, praying, silence, and other very un-fun things. But to not recognize God as the origin of all things fun would be to carve Him out to be a scrooge or a grinch. Not only did God create fun and celebration, but He requires it. Many of the laws found in the Older Testament were instructions for how to celebrate correctly. There were festivals and parties ordained by God because He is a God of celebration. By engaging in Halloween as a celebration, we create opportunities to invite people into our homes and build relationships. This is not only true of Halloween, but of any holiday. When Robb and I threw our banging party this past weekend, Christians and non-Christians alike showed up. They came into our home and ate and drank with us. I can’t think of a better place to build relationships and show the love of Christ to people than at a celebration in our home. Even on Halloween night, families come to our doors looking for candy, but why stop there? Why not build relationships? Build spooky haunted houses for the kids to walk through. May our houses be homes of celebration. My uncle Mark is somewhat of an expert on horror. Specifically, the intersection of horror films and theology. He writes in one blog post, “Horror — whether real or imagined — points to a need for salvation.” The crucifixion is the ultimate moment of horror in human history. I have a friend who, long story short, can see demons and angels every day. Everywhere he goes. He asked God for it one day, and just like Gehazi in 2 Kings 6:17, his eyes were opened to this spiritual world. Ask him if he ever forgets that the spiritual world is real and present and active. David Mathis says that another Spirit haunts our lives: The Holy Spirit. We forget that as believers, we essentially become haunted houses — a Ghost comes and lives inside of us. Of the gremlins and orcs which attempt to come and steal our eyes away from God, Mathis writes, “Jesus haunts their Halloween.” God is a spirit and far too often, we neglect to remember His constant presence in our lives. 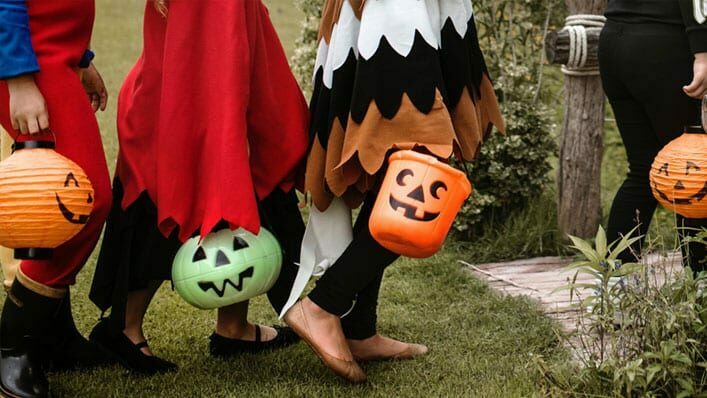 In addition to a reason to dress up and have fun, Halloween can effectively remind us of the evil and the spiritual forces active in our world today. Most of the year, these things go unnoticed and unobserved, but Halloween can be a call to remember the invisible world around us. Demonic-looking decorations are just that. Decorations. Throughout the Bible, God makes it clear how powerless statues and idols are (Habakkuk 2:18, Isaiah 40:19). Jeremiah 10:5 even says, “Do not fear them; they can do no harm nor can they do any good.” The problem with these statues in the Bible is not the little wooden or metal object itself; the problem is that God’s people worshipped them. Their affections were turned toward these little powerless objects rather than toward the God who made all things. I think we do the same with objects today when we assign them greater influence than they deserve. A dreamcatcher is not inherently evil, it’s feathers tied to some string. A Ouija board is some cardboard with a piece of wood. The difference is, when we treat these things as portals or passageways for evil spirits, they will gladly oblige. But when we see them as powerless artifacts made in a factory somewhere and sold in Walmart, then they will be just that. You won’t ‘catch a curse’ by walking too close to that plastic gargoyle in Target’s Halloween aisle. There is a house near me here in Denver which has consistently won “Scariest House in Denver,” and the reason is evident. There are gallons and gallons of fake blood, tortured corpses hanging from chains, demonic cannibal babies sitting around a fake fire roasting another victim. Ghouls circle overhead and legless bodies drag themselves across the yard. It would be too easy to point at this and accuse them of demonology and witchcraft, but let’s look at it another way. All of the animatronic beings in the yard are plastic. They run on wires and gears. Just like your Subaru. They were made in a factory somewhere, or maybe even handcrafted by an artist. But when we as Christians attribute to these decorations more power than they are due, we are the ones fearing “mute idols,” as Paul calls them. Personally, I like the occasional scare to make my hairs stand on end. I appreciate the artistry and like to have fun with it. We need to remember to build bridges to our neighbors rather than walls, and nothing puts bricks up faster than cynically sneering at our neighbor’s demonic decorations. No, they are just that. Decorations. Don’t give them more power than they are due. But Halloween is rooted in Pagan, demonic tradition! Sure. So are Christmas and Easter. According to the internet. Other websites will tell you Halloween has Christian origins. You can literally Google anything to support your claims and increase your fear of worshipping the wrong gods. In actuality, when most of us observe Halloween, we are simply buying into the American corporate construction allowing candy, costume, and booze companies to rake in more dough at the end of October. We are so far removed from any spiritually dangerous activity that it’s almost laughable. Dressing up like Pac-Man and soliciting free sweets is not a cultic ritual. Who’s funny costume got the most Likes? I doubt any of you (Christians) sacrifice animals, recite chants, doodle pentagrams and burn sage in an attempt to get into the spirit of Halloween. Most likely, you and everyone in your neighborhood are taking an excuse to dress up, eat a lot of candy, and have FUN. Something Christians can be bad at. May we be Christians who show the world how to celebrate.